When a big question mark of what’s for dinner hangs over my head, I usually turn to upma, pasta or polenta. 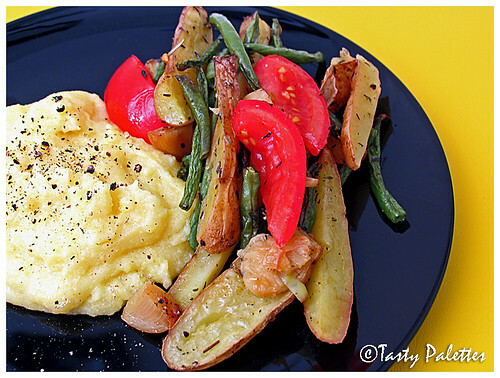 Polenta is very easy to make and can be paired with vegetables in a variety of different ways. I like to have polenta by itself, with some herbs and parmesan cheese. 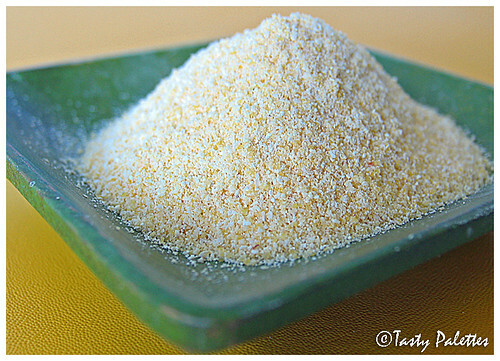 Cornmeal, which is ground dried corn, is boiled in salted water, resulting in creamy and delicious polenta. I usually serve polenta with roasted vegetables. Those odd vegetables lying in your crisper can be put to good use in this recipe. The roasted vegetable medley itself can be served as a warm salad too. My favourite ingredient in this recipe is roasted garlic. Though I have given the recipe to prepare them beforehand, you can roast the garlic packets in the same pan where the vegetables are cooking. 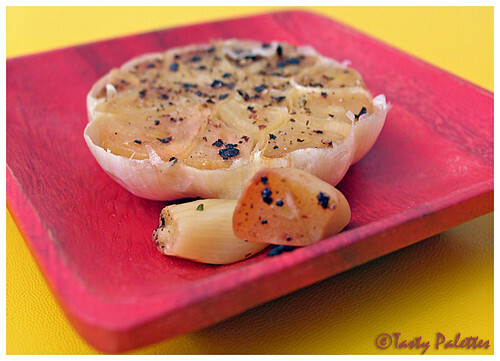 I always prepare extra bulb of roasted garlic and use them in other recipes. They stay good refrigerated for 2 weeks. Halve a whole garlic bulb horizontally. Place each half in two pieces of aluminum foil, drizzle with oil, salt and pepper. Wrap the garlic halves and roast in a 475F oven for 20 minutes. When they are cool enough to handle, squeeze the bulb and collect the roasted cloves of garlic. Use as needed in the recipe. Heat water to a rolling boil. Reduce the heat to medium, add salt to the water. Slowly pour the cornmeal to the boiling water while swiftly whisking with the other hand to avoid lumps. Keep stirring for another 10 minutes until the cornmeal is cooked and comes together. Take off from heat, add butter and mix thoroughly. Preheat oven to 450F. Halve or quarter the potatoes depending on the size. Snip the ends off french beans. Quarter the tomatoes. Cherry tomatoes can be used whole. In a large bowl, toss the potatoes and beans with olive oil, salt and pepper. Place on a baking sheet and roast for 15-20 minutes, until the potatoes are tender and the beans is beginning to crisp. In the same bowl, toss tomatoes in the remaining olive oil with thyme and rosemary. Add to the potatoes and beans, shake the baking sheet to rotate the vegetables, and roast for 5 more minutes, until the tomatoes soften. Add roasted garlic cloves to the vegetables. Adjust seasoning, if needed. Serve vegetables with polenta, with a drizzle of balsamic vinegar, if needed. Few weeks back when Indira asked about our responsibility towards our favourite blogger, the first person to come to my mind was Saffron Hut. Hers was the one of the blogs I follow regularly for more than a year now. She has everything one can ask for in a blog, interesting and humorous posts (remember smelly cat), dependable recipes (it is from her I learnt to freeze rotis) and beautiful presentation. She is one of my inspirations to write a blog of my own. It is sad that she doesn’t blog that often as she used to, which, I inferred, is due to her health issues. I sincerely wish SH that she gets better and come back to us, the food blogging community. For this month’s MBP, themed Preserve it, hosted by Coffee, I am made her tomato pickle. 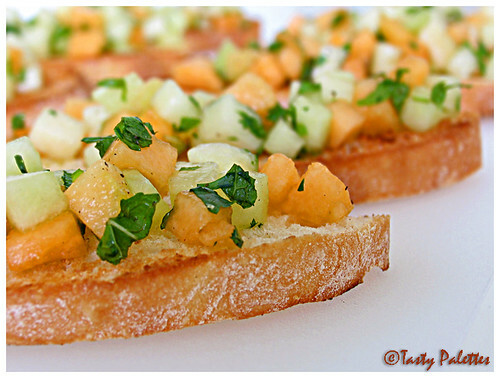 It is easy to prepare, tasty and goes well with almost anything. I have made this pickle for quite sometimes now and I am happy the way it is, no changes at all. 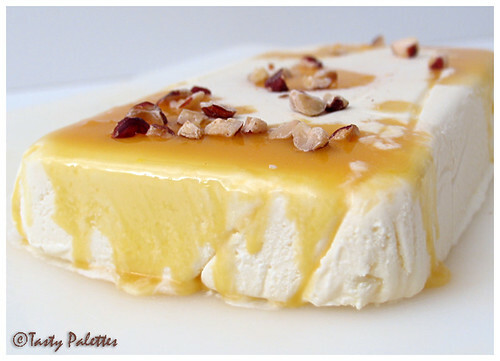 You can find the recipe aesthetically written in her blog. I am not even going to try match that :). 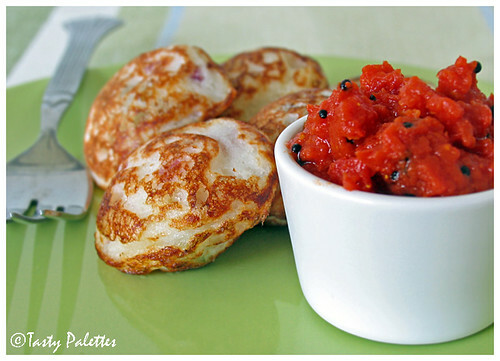 Tomato pickle served with kuzhi paniyaaram. 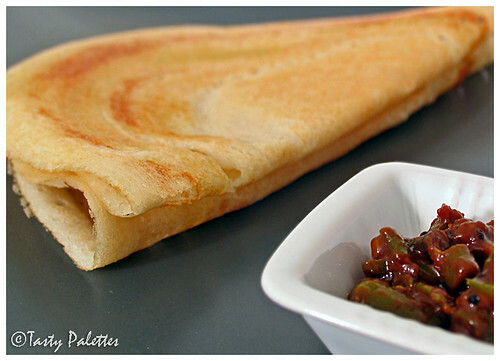 Kuzhi paniyaaram is made with left-over idli batter, onion, green chillies, curry leaves and asafoetida. 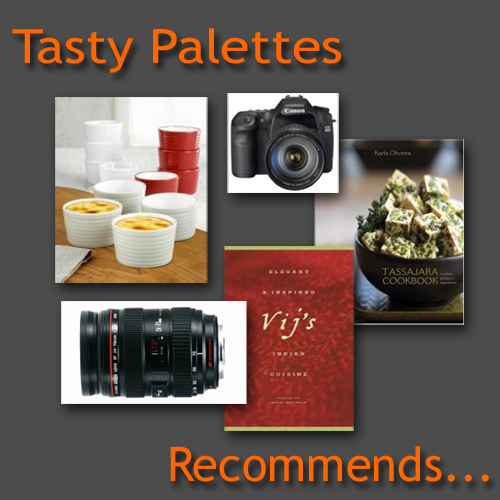 For other recipes and recommendations on the pan, visit Nupur and Indira. Tortellini are ring shaped pasta stuffed with various fillings such as meat or cheese. Originally from Bologna, Italy, legend has it when the gods walked the earth, an innkeeper was so enchanted with the beauty of Venus, he modeled the little tortellini after her navel. Vegetarian frozen tortellini are usually stuffed with cheese and can be used in soups. Boiled in vegetable broth with salt and pepper is my favourite way of preparing them. But most of the times I prefer tortellini light, hence I buy dried ones stuffed with a variety of vegetables. Though they taste good with bare vegetable broth, I jazz them up with a special ‘something’ that adds a homemade touch to the otherwise ordinary store-bought dinner. The sauce is easy to whip-up with just your pantry ingredients. Roasted red pepper gives it a sweet, smoky but scrumptious flavour. 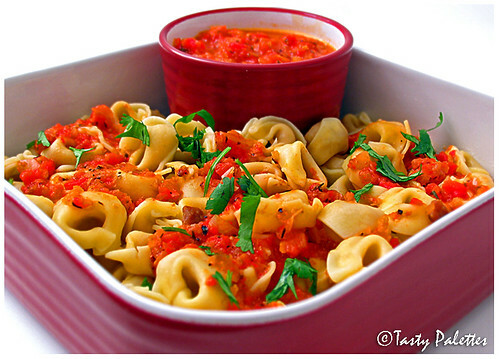 I have used sun dried tomato and oregano tortellini in this recipe. Cook tortellini according to package directions, drain and reserve. Puree the roasted red peppers until smooth. In a pan, heat oil, sauté onion and garlic until soft. Add the pureed roasted pepper, chilli powder, sugar and salt, and heat through. Stir in the herb and pour the sauce over pasta. Toss gently to coat and serve. This is my entry for Waiter There Is Something In My... Sauce hosted by Andrew Barrow of Spittoon Extra. 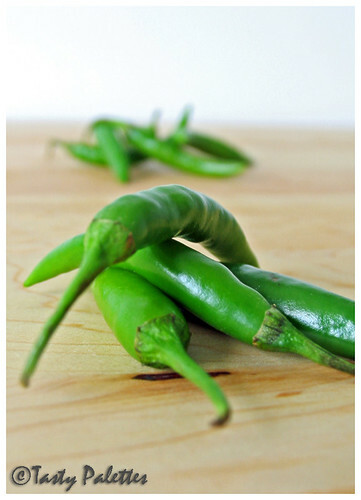 Nupur gave us the liberty of trying an unknown vegetable - X, for her A-Z of Indian Vegetables. 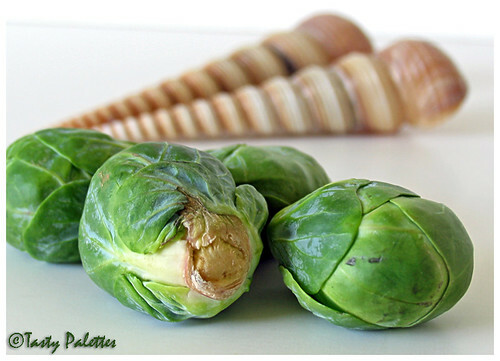 There are many vegetables that I haven’t tried yet - artichokes, patty pan squash, mustard greens, to name a few. But when I went to the market these green beauties caught my attention. I have to admit that I have tried tomatillo once in a soup. It was too sour for my taste and I stayed away from it for almost a year now. Since this is an opportunity to try something new, I decided to give tomatillos a second chance. 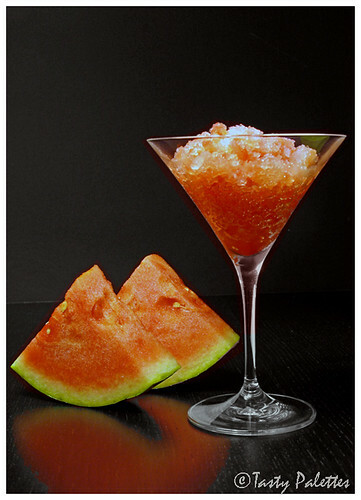 I wanted to carefully pair them with ingredients that will compensate the sourness. 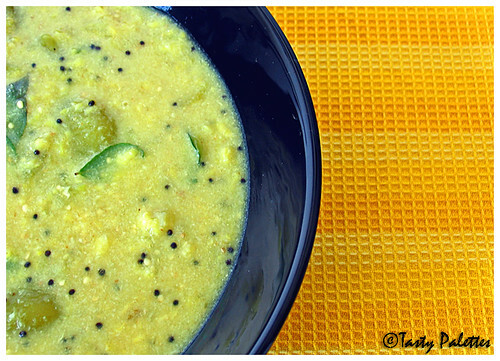 My mom prepares this dal or kootu using green, unripe tomatoes. 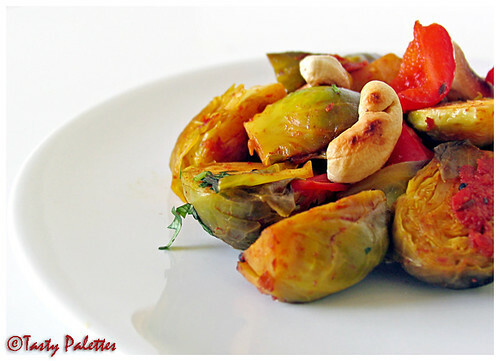 Since tomatillos look like green tomatoes I decided to use them in this recipe. 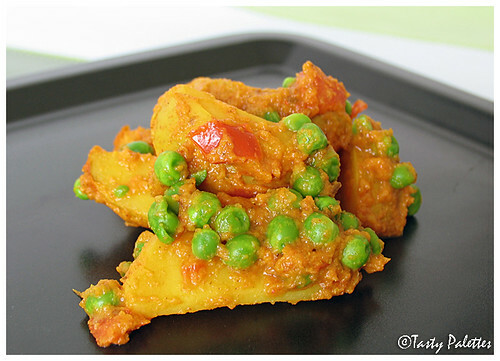 You can use other vegetables like chayote squash (chow chow), tomatoes (goes great with chapatti), carrot etc. While buying tomatillos, buy small green ones. They look like green tomatoes with husk. The husk says a lot about its freshness. It should wrap the fruit tightly and should be light brown in colour. It should not be shriveled or dried. 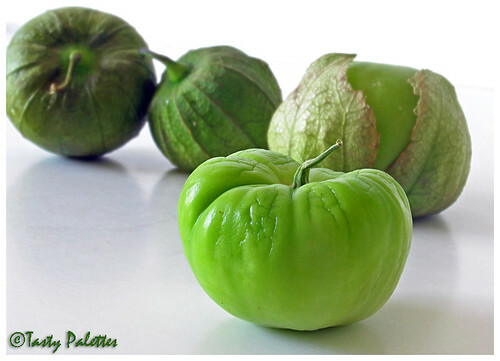 It is said that leaving tomatillos to rip further enhances its sweetness, I haven’t tried this though. Cook moong dal with turmeric powder until soft. Grind coconut, green chillies and cumin powder into a fine paste. In a vessel boil tomatillos in ¼ cup of water with salt and turmeric powder. The tomatillos turn from bright green to greenish yellow as they cook. Mix dal and ground spice mixture to the vegetable and simmer for 5 minutes. In a seasoning pan, heat oil, splutter mustard seeds and curry leaves and add to the dal. Serve with rice. I was hesitant when Sunita tagged me for this meme of 7 Random facts about me, because I don’t know whether there are any facts about me at all. But when Tee tagged too, I thought, what the heck. So here it goes. I am a cat fanatic. I have had 22 cats over 10 years before marriage. I can speak cat (like Dori speaks whale) and I can even understand their body language. Someday I want to write a book about cats. I have a great passion for music. Though I learnt Carnatic music for 7 years and have lost touch, I still can appreciate music in almost any form. You can find me humming a tune most of the times. I am a cartoonholic. Not only that, I love comic strips. My favourites are Calvin and Hobbes, Tin Tin and Peanuts, in that order. I and Usha at Samaikalam Vaanga were classmates during our post-graduation. I can easily start a conversation even with a stranger and can make friends within minutes. My ex-boss and a good friend calls me ‘Nokia Gal’, because I am always ‘Connecting People’. 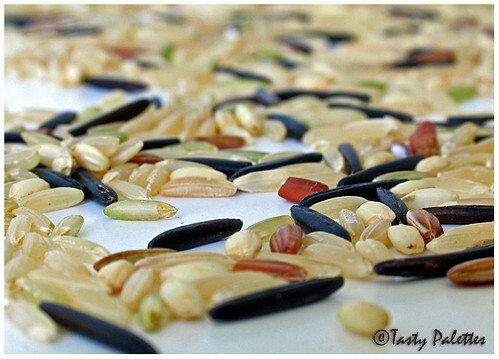 I landed in the world of food blogging through Gopalsworld. I came to his blog through a Google search and was drawn toward his writings. I noticed Shammi’s comment in one of his posts and was expecting yet another interesting and funny blog as her brother's. Interesting and funny, her blog is. But I noticed something else too, her food blog. From one click to another.. Well, rest is history (ya right!!) :). I cannot make pumpkin pie. Both the times I have tried making it had been more than disastrous. Ooey gooey mess it was. I have vowed never to make pumpkin pie again. So its proven again that G is a better photographer. Duh! He is my photography guru, for crying out loud. Two years back if you had asked me for the exif of a photo, I would have said, “What?!”. And when G came into my life, I developed a liking towards photography for he was an excellent amateur photographer. I am glad I developed that interest, because, it is not easy to wait for 30 mins on a hike when he patiently follows an ant or focuses on a fallen leaf. But I learnt a lot on those long waits, patience being one of them :). Here are some of his photos. 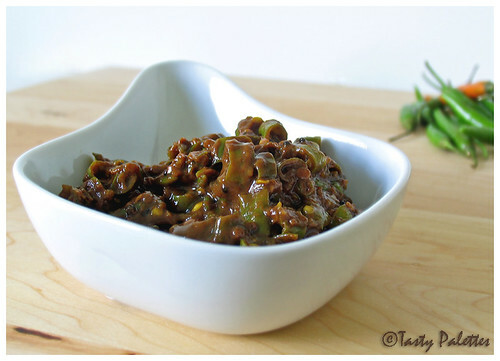 Only after starting this food blog did I realize that food photography is way different than others. It is not very easy to capture a pleasing picture of a dish, its texture and colour, lying in a small plate. Not to mention the feat of food styling and plating. G patiently learnt (food photography was new to him too) and taught me few tricks of the trade like macros, perspective of a shot, lighting, etc to make a picture interesting. Therefore, I am not quite surprised that you liked his choice. I thank each one of you for letting me know your thoughts. 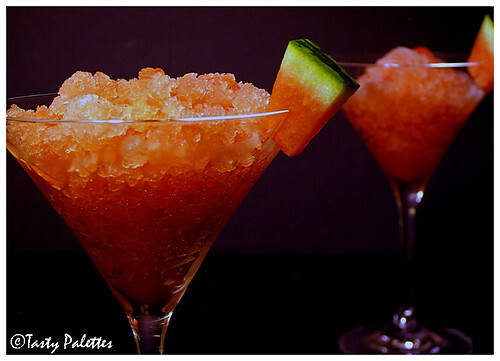 But I still like the daytime shot of the Granita :). When Meeta of What’s for lunch honey announced this month’s Monthly Mingle theme, I had already decided the entry. I was waiting for an occasion to make this special treat. And I did, for my Birthday! 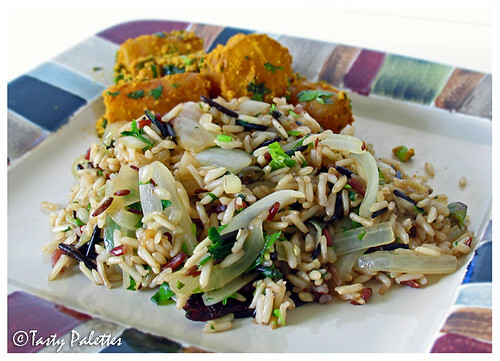 The moment I laid my eyes on this recipe in Foodbeam by Fanny, I wanted to try it. It was sinfully delicious and its hard to believe that an easy recipe like this would yield something that is beyond words. You have to try this yourself to know how it tastes like. But be warned, this dish is beyond rich and creamy. So this is for those mighty hearts that braves calories. Hey, we live only once, so go ahead and indulge. As Fanny describes, I only had a minute to take the pictures. It melts fast and then its Gooey Kablooie. Also, use the best quality honey that you can find. It makes a lot of difference here. Spray/coat a loaf pan with oil or butter, cover it with plastic wrap, set aside. 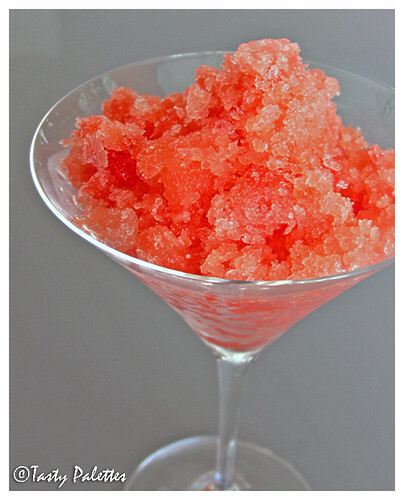 Take a medium sized glass bowl and keep it in the freezer for 10 mins. Boil a cup of water in a sauce pan and turn it into a simmer. Choose a bowl that partially immerses into the pan. The bottom of the bowl should not touch the simmering water. This is called a double boiler. Take egg, egg yolks and honey in the bowl and beat it with an electric beater over the double-boiler. The mixture will turn pale and creamy as the eggs get cooked indirectly. Take the chilled bowl from the freezer and beat heavy cream till it forms soft peaks. Chilling the bowl contributes to stable peaks. Gently fold the egg mixture into the whipped cream and pour into the prepared loaf pan. Cover the pan with plastic wrap and freeze for at least 3 hours. To serve, transfer the pan from freezer to fridge for 5 minutes and invert onto a serving platter. 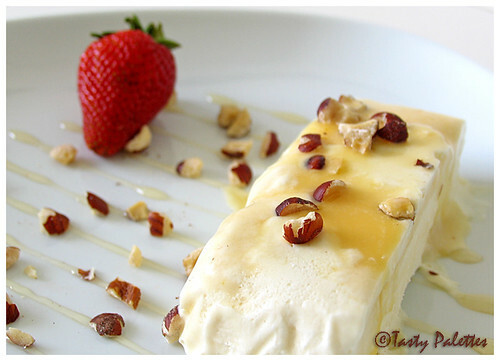 Slice and serve with hazelnuts and a drizzle of honey. 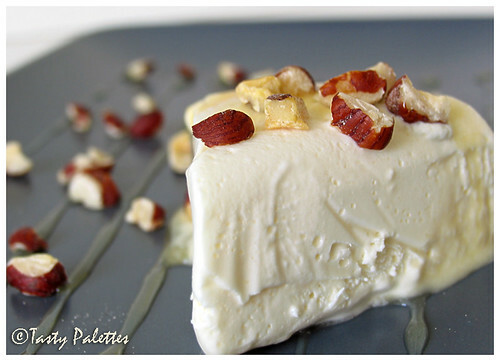 Thanks Fanny for this wonderful recipe which is now my all-time favourite!